Developing a panel-handling interface that can handle sensitive materials of varying thicknesses is no trivial matter. Standard panel handlers – for example, your basic pick-and-place equipment – are unable to handle the complex, multi-step, integrated needs of many custom manufacturers. 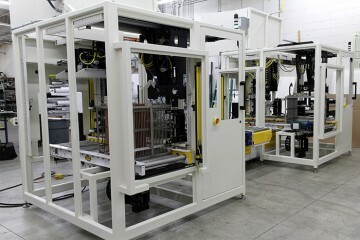 Our panel handling equipment systems are designed specifically for your sensitive material and panel size, and are configured to handle streamlined, highly integrated, multi-stepped processes. Where Northfield Automation Systems shines is in modifying a customer’s current process so we can integrate improved automation for optimized throughput, accommodating varied panel size and panel thickness. Northfield Automation System’s panel handlers easily interface with most equipment that processes material in panel form. Our equipment’s ease of use and flexibility allow you to have multiple batch runs using different materials with minimal change-over times.